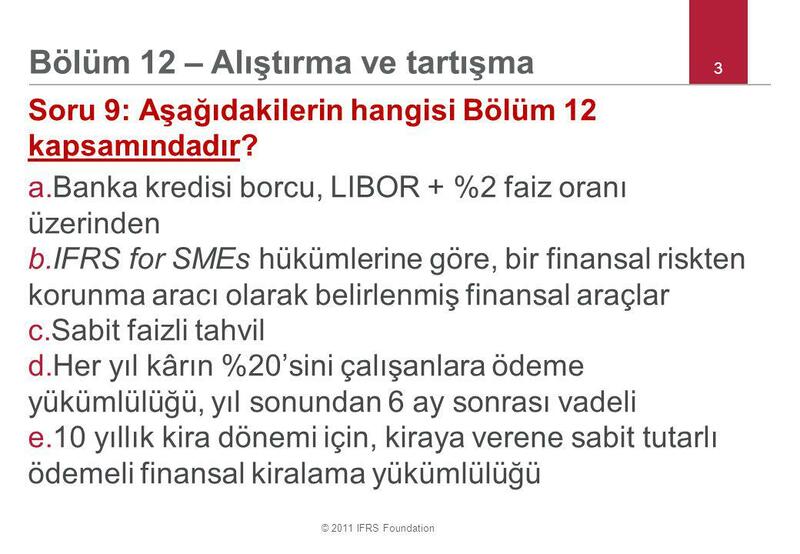 © 2011 IFRS Foundation 1 IFRS for SMEs Konu 2.2(b) Alıştırma ve Tartışma Bölüm 12 Diğer Finansal Araçlar Bölüm 22 Borçlar ve Özkaynak. 2 2 This PowerPoint presentation was prepared by IFRS Foundation education staff as a convenience for others. It has not been approved by the IASB. The IFRS Foundation allows individuals and organisations to use this presentation to conduct training on the IFRS for SMEs. 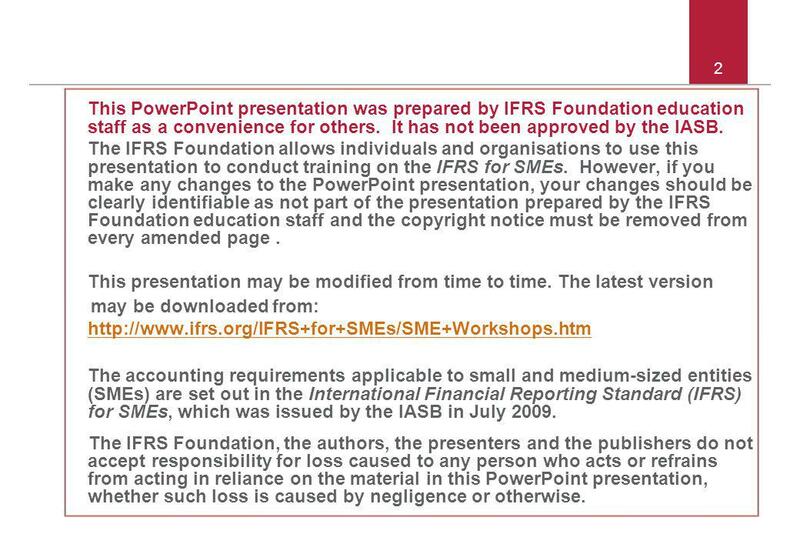 However, if you make any changes to the PowerPoint presentation, your changes should be clearly identifiable as not part of the presentation prepared by the IFRS Foundation education staff and the copyright notice must be removed from every amended page. This presentation may be modified from time to time. The latest version may be downloaded from: http://www.ifrs.org/IFRS+for+SMEs/SME+Workshops.htm The accounting requirements applicable to small and medium ‑ sized entities (SMEs) are set out in the International Financial Reporting Standard (IFRS) for SMEs, which was issued by the IASB in July 2009. The IFRS Foundation, the authors, the presenters and the publishers do not accept responsibility for loss caused to any person who acts or refrains from acting in reliance on the material in this PowerPoint presentation, whether such loss is caused by negligence or otherwise. 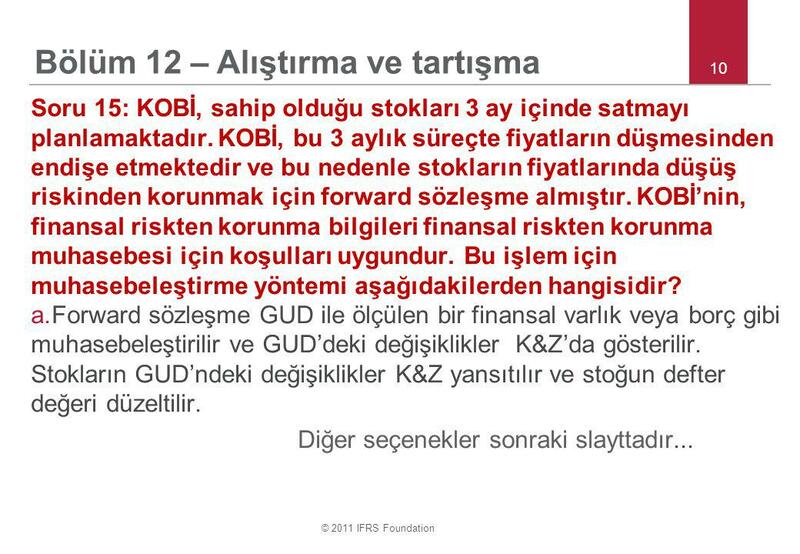 IFRS for SMEs 1 Konu 1.6 Bölüm 23 Hasılat © 2011 IFRS Foundation 1. 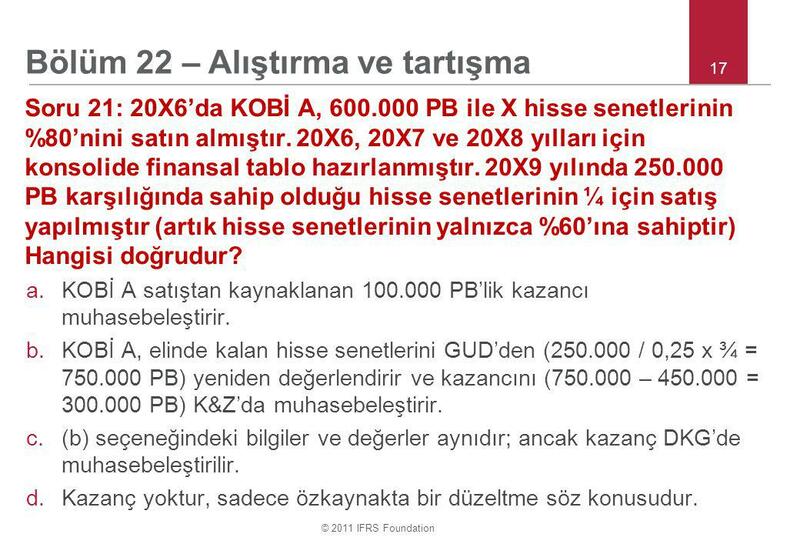 © 2011 IFRS Foundation 1 IFRS for SMEs Konu 3.3 ve 3.4(b) Test ve Tartışmalar Borçlar Bölüm 20 & 29. 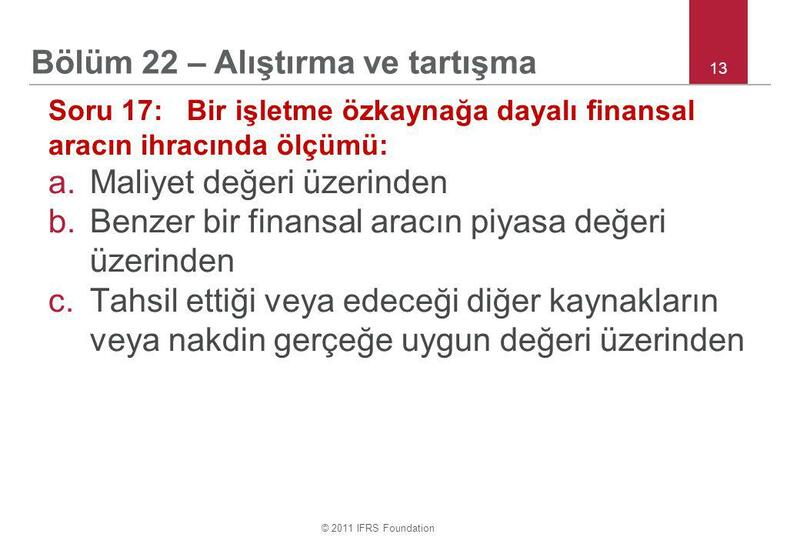 © 2011 IFRS Foundation 1 IFRS for SMEs Konu 3.4(a) Test ve Tartışmalar Borçlar Bölüm 21 & 28. 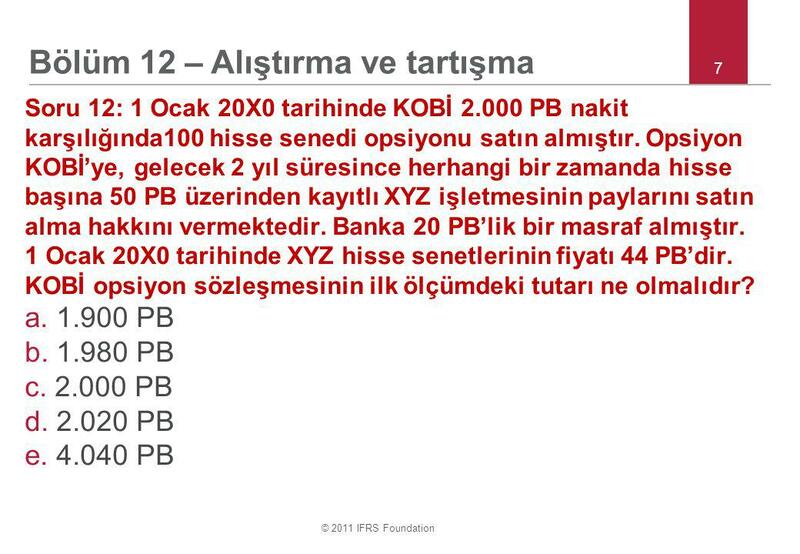 © 2011 IFRS Foundation 1 IFRS for SMEs Konu 2.5(a) Test ve Tartışma Varlıklar Bölümler 13,16 –18 & 27.